Germany, the largest EMU economy, has run nothing but current account surpluses since July 2001 with only two monthly exceptions. That is 183 months of surplus vs. only two months of deficit over a period of 15 years. If this were a gold standard, Germany would have acquired an addition 2.2 trillion euros worth of gold over the last 15 years representing its accumulated current account surpluses. And viewing it in this way exposes the sense of this policy being exploitative. A country does not acquire gold reserves from the moon. It acquires them from another country. Germany's policies have glommed onto and absorbed domestic demand and built up net asset positions of enormous magnitude over the last 15 years instead of contributing to global demand. That has been by choice. The German current account has 'fallen' to about 7.5% of GDP recently while the EMU current account ratio to GDP is in the neighborhood of 3.5% of GDP. Since February 2013, the EMU-excluding Germany current account has run a steady current account surplus. Surpluses have been posted in each month since February 2013 except five. That's a period of 47 months or four years with only a handful of surpluses for the EMU even excluding Germany. Is the euro low? I guess so! Let's play euro limbo! How low can you go? The chart at the top posts the German and overall EMU current account surplus paths. 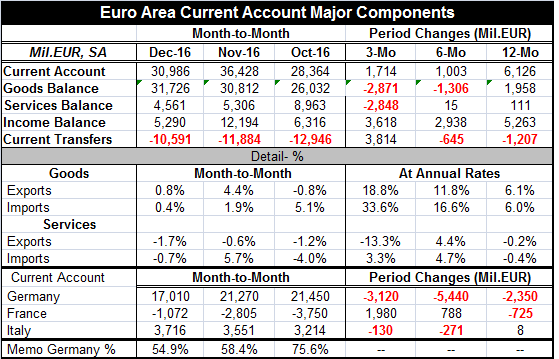 For this period, Germany, of course, is the bulk of the EMU surplus accounting for about 55% of the EMU surplus in December. But that is down from two-thirds and much more of it prior to September of last year. Recently the Germany surplus which as percentage of GDP is one of the very largest in the world has been declining, but the rest of the EMU has seen its surplus rise and it has generally been rising as a percentage of GDP. These trends help to get us to the root cause of the surplus which is the weakness in the exchange rate in addition to weak EMU (and German) domestic demand. Were the EMU region growing faster, it would absorb more imports and that by itself would shrink the current account surplus. But demand is weak and Europe is trying to stimulate GDP and demand in general. The extraordinary stimulus of the ECB is meant to keep interest rates low to rekindle demand, but that also under cuts the euro and weakens it on foreign exchange markets. That weakness or put another way - that boost to euro area competitiveness - allows EMU-area countries to exploit demand in the rest of the world and to rebuild growth based on demand conditions elsewhere while they purse fiscal integrity at home. This "pulling yourself up by your neighbor's bootstraps" is what is known as a beggar thy neighbor policy. The German ideology of balancing the budget and of fiscal responsibility has been driven so thoroughly through the EMU that the only way to get growth in gear is to purloin it from trade partners. Of course, Germany itself is nearly running a fiscal budget surplus and is in perhaps the "best shape of any country in the world" to execute some fiscal stimulus to add to some much needed global demand. But as Donald Trump points out the U.S. has not been able to get Germany to fulfill its obligations to spend a reasonable fraction of its own GDP on NATO and defense. Why do it when the U.S. will protect them? This is just another way to see why Trump, at least, is mad at the existing world order and has vowed to shake it up. It would be very helpful to the rest of the world if Germany would provide more stimulus and it would not be a detriment at all to Germany that already runs such a massive trade and current account surplus. Anorexia: for the whole family! Germany believes in fiscal austerity and it controls the policy reins in Europe and is pushing the agenda of restraint there to the hilt. This has -to the German's own chagrin- led to awkwardly expansionist policies by the ECB something (of course) that the Germans also oppose. In the German view, the central bank is a one-objective institution and it exists to control and discipline inflation. While EMU inflation remains well within the bounds set for it, inflation has begun to stir. Were the ECB the Bundesbank and were Germans in full control, European rates would now be rising- but those are counterfactuals and not the real situation. The problems in Europe stem from European mismanagement and opportunism pursued within the EMU mechanism itself by its members! Germans took the long view and restrained inflation below everyone else and is now reaping its reward. Mediterranean nations wanted low rates so they could borrow and they overdid it and have been made to pay since Germany took a different path and it anchors the EMU financially. The ECB made policy based on a weighted average inflation rate knowing full well that the 'price levels' for various 'country' segments in the EMU were being ratcheted in different directions and that such a thing would be unsustainable. Still, German and French banks lent willingly into that 'rats' nest' of debt and inflation in the rest of the EMU. No one saw or acted on the big picture for Europe. No one feared consequences. These omissions are now creating adverse spill-over (and have been for some time) affecting the rest of the world. Absorbing domestic demand from the global economy outside the EMU is not a very hospital thing to be doing with the global economy in such circumstances and struggling to generate more demand. The image in your mind should be that of two patients in intensive care, one getting a transfusion from the other and improving his health faster as a result. In this environment, weak currency countries (engaged in the so-called race to the bottom) are engaged in a very destabilizing activity. The U.K. with its Brexit issues and sharp recent rate cuts by the BOE has through the pound sterling, come to this race late but it has quickly become a front runner. And so the dollar remains strong. Currency rates are relative things. When my bond's price rises, your bond's price may not fall. When my stock market rises, your stock market may not fall. But if my currency rises relative to yours, that MEANS your currency falls. So foreign exchange policy is necessarily EITHER a bargained thing between two countries or something left to the wisdom of markets. And currency pairs do not move independently: they move inversely. Sterling can't fall to cushion the impact of Brexit while the euro falls to stimulate growth in Europe as the dollar reverses to fall to unwind its overly strong position. Such things may seem like sensible policy moves, but in fact they are wholly incompatible on the same timeline except perhaps by HG Wells. In contrast, the U.S. has melded these two things over the years into a policy of letting the dollar be just about anything our trade partners have wanted (subject to occasional loud whining) and we have reaped the result of that decision: never ending international trade deficits -never ever. Plus...lower physical investment in the U.S., weaker U.S. productivity as a result of lowered investment and a poorer quality of job on offer. The main problem with the global economy today is that foreign exchange rates have NOT been left to be set by the markets. Too often, countries have used policies of long-term or short-term manipulation to generate a currency value to bring about a desired mercantilistic currency result. And so we are left in this circumstance today in which countries purse allegedly domestic economic agendas and rely on the foreign exchange aspect of these policies to be on the cutting edge of stimulus because domestic policy is being run to purposely to dull the cutting edge of stimulus there. Fiscal budgets are being reined in. Monetary stimulus is left with only one channel of impact. There should be no confusion about what is being done or how this works. The 'domestic monetary policies' are wolves in sheep's clothing. The masquerade of pulling us up by our own bootstraps is only verbiage to distract from the fact that we are really stepping on the back of our also stuck in the mud neighbor and our 'progress' further presses him into the depth of the muck. And yet, because of past policy excesses, it is also true that room for other domestic maneuver has been reduced by past fiscal excess. China, once free to use debt, has botched the job and used its room to maneuver to extend and play out its former/current dead-end policy tact rather than to use debt to shift to something new and more productive. It has leaned overly hard on that instrument and now finds itself as a charter member of the mile-high-debt club with growth slowing. These facts are some of the main reasons to remain somewhat skeptical about the stirring of the global economy. In the U.S. economy last year, debt usage was especially prevalent. No wonder the economy finally started to show some growth by yearend. But make no mistake about it. Global growth remains challenged and there is no place where growth seems to have gotten a firm and dependable toe hold. All routes to growth are still fraught with danger. Technology is still displacing jobs. Outsourcing is alive and well even if in the U.S.; well, Mr. Trump is trying to truncate it. Demographics and labor force participation are showing no exogenous path to more demand. And neighbors have all gone begging. How this ends up producing lasting growth as oil prices rise and central banks overreact to that does not seem obvious to me, at least. Are happy days really here again? Is Mr. Trump re-railing us or derailing us? Enquiring minds still don't know.